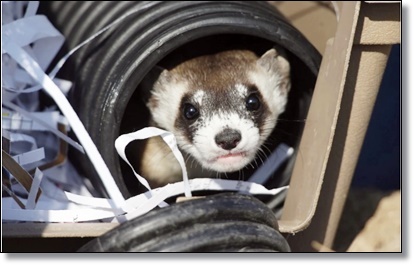 Black-footed ferrets are America’s ferrets, the only ones native to this country — and they’re in trouble. What better way to help save them than one of America’s favorite contraptions, the drone? The U.S. Fish and Wildlife Service is proposing to use unmanned aerial vehicles, more commonly known as drones, to rain peanut-butter pellets down on northeast Montana. The tasty ammunition is laced with a vaccine against the plague. The targets are prairie dogs that are commonly afflicted with the disease. Getting those rodents to scarf down the drone-fired bait would keep them healthy, which in turn would help the ferrets, because black-footed ferrets eat prairie dogs. Prairie dogs, in fact, make up 90 percent of the diet of the carnivorous ferrets, which also live inside the prairie dogs’ old burrows. 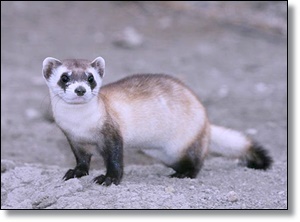 Black-footed ferrets are, in other words, entirely dependent on prairie dogs. 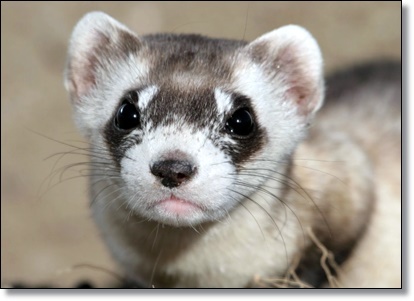 And keeping black-footed ferrets alive is a key mission for Fish and Wildlife, whose literature charmingly refers to the animals as “BFFs.” They’re cute and oblong, with the face of a tiny badger, and they’re among the most endangered species in the world. As Americans pushed west, prairie dog eradication programs, agriculture and development removed much of the ferrets’ prey and habitat, and by 1987 just 18 of the little masked creatures remained. They’ve since been captured, bred in captivity and reintroduced to more than two dozen spots in eight Western states and Canada and Mexico. But there still aren’t many of them, and the flea-borne plague is a big threat. For years, Fish and Wildlife workers have squirted flea-killing powder, by hand, down into prairie dog burrows across the plains. But that’s labor-intensive and inefficient, and there are signs the fleas might be developing a resistance, said Fish and Wildlife biologist Randy Matchett. 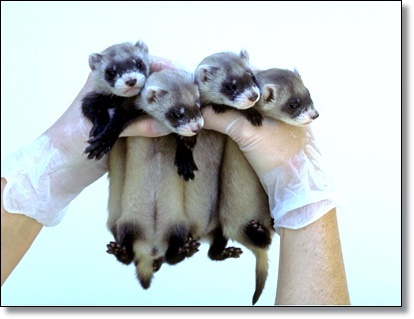 Vaccinating the ferrets from the plague is also tough, because they live underground and are nocturnal. Enter the peanut butter pellets — and the drones. Matchett has been hard at work developing the pellets, which encase a vaccine that has worked in lab trials and in small patches of the wild to protect prairie dogs from the plague. Now the government wants to expand the trials to bigger, 1,000-acre areas. The idea is to head out in the early mornings, while ferrets are sleeping but prairie dogs are active, and drop a pellet every 30 feet. In tests, that rate has enticed 70 to 95 percent of prairie dogs to eat the bait (which Matchett said he knows because it tinted their whiskers pink). The pellets, by the way, are not M&Ms, as has been reported elsewhere, Matchett said. “We do not have an official candy of the U.S. Fish and Wildlife Service,” said an agency spokesman, Ryan Moehring. They are “more like a mini-marshmallow,” Matchett said. But how to efficiently dispense them? Matchett has proposed testing two ideas at a national wildlife refuge in northeastern Montana: Strap a GPS-sensing dispenser to a human-driven ATV that shoots a pellet left, right and down every 30 feet. Or strap the same sort of dispenser to a fixed-wing drone, which could be cheaper and speedier, treating two acres a minute, Matchett said. “You see how the math and that velocity really get attractive,” he said. Though the use of a drone would be novel, this is hardly the first time airdrops have been used for conservation. Among the most delightful examples actually involved airdropping the animals themselves. In the 1950s, the Idaho Department of Fish and Game rounded up beavers that were wreaking havoc on private property, packed them by twos into wooden boxes, attached them to parachutes and dropped them into remote areas where the toothy rodents’ dam-building skills were needed. In 2013, U.S. helicopters dropped 2,000 dead mice strapped to makeshift cardboard and tissue parachutes onto the forests of Guam. 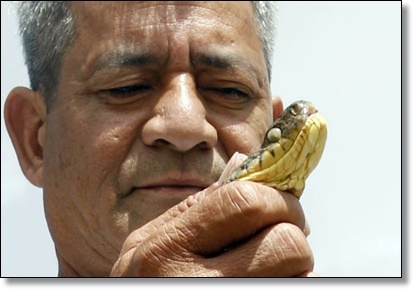 Their mission: Kill invasive brown tree snakes. The mice had been studded with acetaminophen, the painkiller in Tylenol, which is lethal to the snakes. The parachutes tangled mice in the trees, where they made perfect tree snake snacks. In the 1970s and 1980s, tens of thousands of vaccine-stuffed chicken heads were airdropped onto the Swiss countryside to help rid foxes of rabies. These days, Texas every year launches what it calls an “aerial assault on rabies,” by sending out planes to drop millions of little plastic packets of fishmeal-coated anti-rabies bait. The targets used to be coyotes and foxes; now they’re also aimed at skunks. This method is used in several Eastern states as well, where the Department of Agriculture has long dropped cubes of anti-rabies laced dog food to prevent raccoon rabies. Back in Montana, Matchett says airplanes aren’t quite right for the ferret mission, because the delivery must be precise, and therefore low-flying. “We’re saving hoverboards for last,” he said of his vaccine-distribution plan. That, unlike the drone idea, was a joke.